CEE tech startups looking for investment, distribution partnerships, media exposure, and valuable connections in the industry are invited to apply to the 4th edition of Startup Spotlight, competition and mentoring program organized in parallel with How to Web Conference 2015. The 32 startups will compete for the 20.000 USD cash prizes offered by IXIA, the main partner of the program, and will get access to a curated deal-making pipeline and unique development opportunities. Applications are open until Friday, October 30, on the program website. Throughout the 3 editions organized so far, Startup Spotlight brought together 96 early-stage tech startups selected out of hundreds of applicants from 36 countries. The finalists have attended so far 600 hours of mentorship and 1100+ one on one meetings with accelerators, investors, and business professionals with relevant expertise. 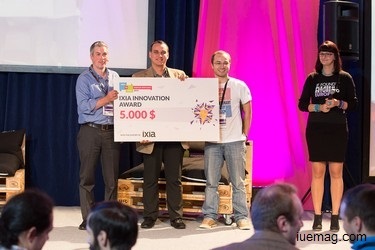 Moreover, the winners received total cash prizes of 60.000 USD offered by IXIA, the main partner of the program. With a 35% success rate, Startup Spotlight is one of the most successful programs in terms of closed deals. 12% of the companies that closed a deal as a direct result of attending the program have raised a VC investment, 34% have been accepted to an accelerator, 27% closed a strategic partnership, whereas the remaining 27% found a mentor or advisor. Among the alumni of the program there are some of the rising stars in the European startup ecosystem: Incrediblue, startup that closed a series A round led by Connect Ventures; MavenHut, company that has recently made the biggest exit in the Romanian gaming industry by selling the rights for Solitaire Arena and Solitaire 3 Arena to RockYou; or AxoSuits, the creators of a medical exoskeleton that’s now undergoing clinical trials. And the success stories can continue: check out the results of the program alumni in the Startup Spotlight Progress Report. "We do believe that Startup Spotlight is one of the most important programs that offers the entire community the chance to get actively involved in developing an entrepreneurial mindset in the IT&C sector. This is why we are happy to support the program for the 4th year in a row”, declared Teodor Ceaușu, Country Manager Ixia Romania. 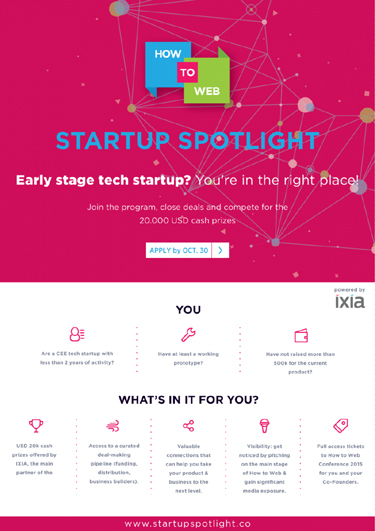 Startup Spotlight 2015 will bring together 32 early stage startups that build tech products with disruptive potential. 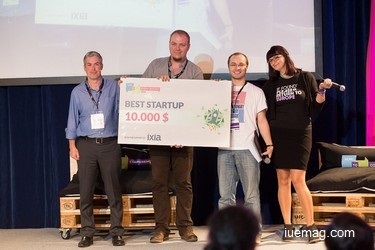 The program is addressed to CEE tech startups with less than 2 years of activity, having built at least a working prototype for their product, and that have not raised more than 500k EUR for the current product. All the finalists will have 12 one-on-one meetings with mentors and investors carefully selected to match their needs. Among the investors that confirmed their attendance so far there are Max Kelly (Managing Director, TechStars London), Carlos Espinal (Partner, Seedcamp), Alan Clayton (Roaming Mentor, SOS Ventures, the organizers of the HAX hardware accelerator), Rune Theill (Co-Founder, Rockstart Accelerator) or Cedric Maloux (Managing Director, Startup Yard). The full list of investors that will mentor the teams is available online on the conference website. “Startup Spotlight is built around bringing measurable economic value to both the startups and the partners involved. We give our finalists access to accelerators, angel investors and early stage VC funds, as well as to potential distribution partners and professionals with relevant expertise in their field of interest. Three years in the program we are happy to see that our model brings value and we do a good matching and curation!”, declared George Dita, Startup Programs Manager, How to Web. Startup Spotlight is a program developed in partnership with IXIA Romania, with the support of Telekom Romania, Bitdefender, CyberGhost, Microsoft, Avangate, hub:raum, Ambasada Canadei în România, Mozilla, and Okapi Studio and will take place on November 25 – 27 in Bucharest. Attendance is free of charge, and startups are invited to apply online by Friday, October 30. The finalists will be selected by a professional jury and will be notified on Thursday, November 5th. Startup Spotlight is organized in parallel with How to Web Conference 2015, the most important event on tech innovation & entrepreneurship in South-Eastern Europe. Any facts, figures or references stated here are made by the author & don't reflect the endorsement of iU at all times unless otherwise drafted by official staff at iU. This article was first published here on 28th October 2015.